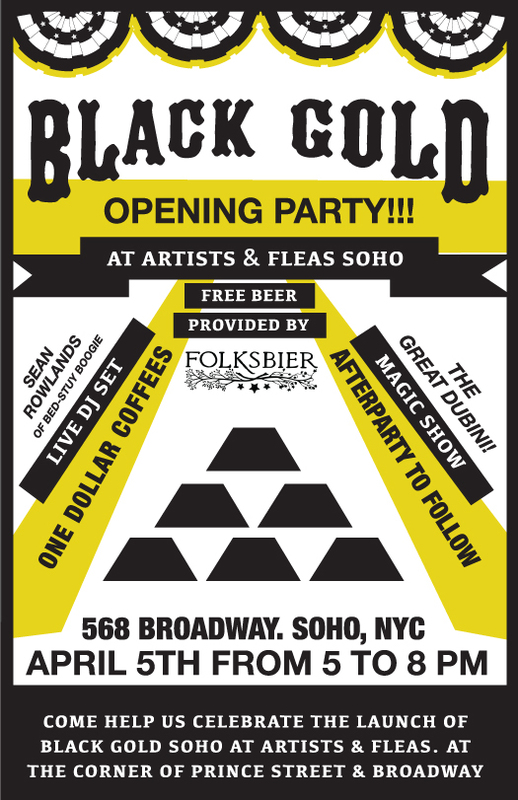 This Thursday, April 5th, Black Gold will be celebrating the opening of Black Gold’s new shop inside Artists & Fleas SoHo (568 Broadway, NY NY). The daytime shopping event will feature full vinyl DJ sets by Sean Rowlands of Bed-Stuy Boogie and Black Gold’s Jeff Ogiba and Mike Polnasek. Magician, The Great Dubini will be performing some mystifying illusions while we mingle, and our friends at our favorite Brooklyn brewery, Folksbier will be serving up complimentary beers from 5pm-8pm or while supplies last. Drinks not for you? Black Gold will be offering $1.00 coffees during that time period, and you can expect some really great prizes / raffles / giveaways. Check out the event page HERE. Come say hi! 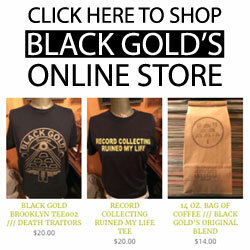 After we close up there, we move the party to Fools Gold bar, right down the street at 145 East Houston. 21+ to enter but free entry all night (9pm – ???). A few more DJs will be joining us for the event including: DJ Eric Pfriender / DJ Brett Burton of Bad Conditions KPISS FM and Fuzz Dance / DASH SPEAKS of Future Old School / Brian Sears of The Lot Radio / More sets by Jeff Ogiba and Mike Polnasek of Black Gold Records and DJ Pat Longo of Primitive Sound System. Hope to see you all there and thanks for the love and support!